Ushio collaborated with writer Tom Downey to illuminate how it's done properly at Tokyo's Yajima Sushi. We live in an amazing time for sushi in America, a time where even little kids are growing up eating the stuff. It might not be incredibly high-end—hell, it might not even be made with the fish advertised on the package or menu—but sushi has no doubt gone mainstream. Sure, you eat sushi three nights a week. But did you know that nigiri sushi (not rolls; just a simple piece of fish atop a finger of sushi rice) actually started out as street food? 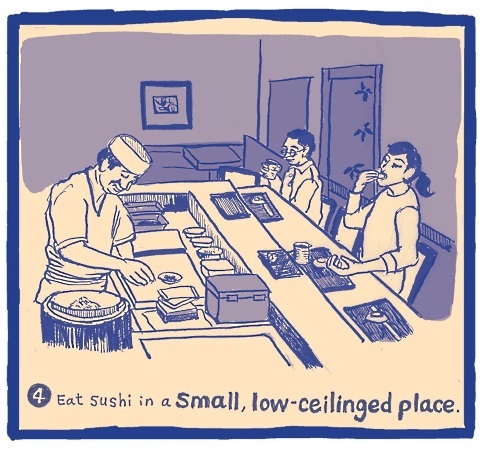 That’s just one fascinating sushi fact that Tokyo chef Susumu Yajima dropped on Medium writer Tom Downey for “The Ten Commandments of Sushi.” The write up is a fascinating look into the kind of passion that makes a sushi chef and his wife run a quiet, tiny restaurant for nearly 34 years without any other employees. 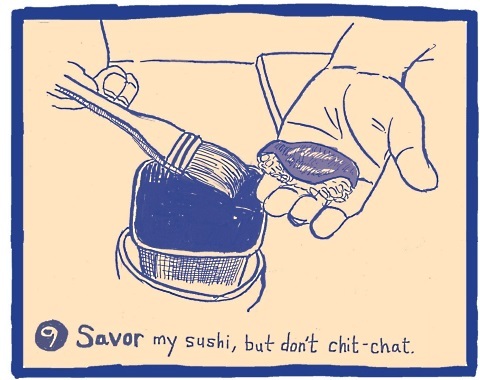 It also features illustrations of each of Yajima’s sushi commandments by artist Chie Ushio. That’s also why many good sushi chefs will serve you only a single piece at a time, not a gigantic platter full of things that you can’t possibly eat all at once. Downey talked about how he’d eaten sushi at a gamut of places, from high-end restaurants to tiny, low-ceilinged shops like Yajima’s. In some places, he said that the sushi creations “emerged as if from nowhere, looking like art on a plate.” But he went on to praise Yajima because Yajima’s place is completely unique to Yajima himself, both as a chef and as a person. If we had to make one generalization about Japan, we’d say it’s a land that takes its food seriously—something we admire very much. Before talking about Yajima’s rule about coming to eat his sushi with your friends, Downey related a story about a ramen shop in Tokyo that has curtains around each seat. When you’re served, the curtains are drawn so you and your noodles can be alone together. Yajima hasn’t gone that far, but his principles are the same. Did you come to his restaurant to talk, or to eat? There’s only one correct answer. 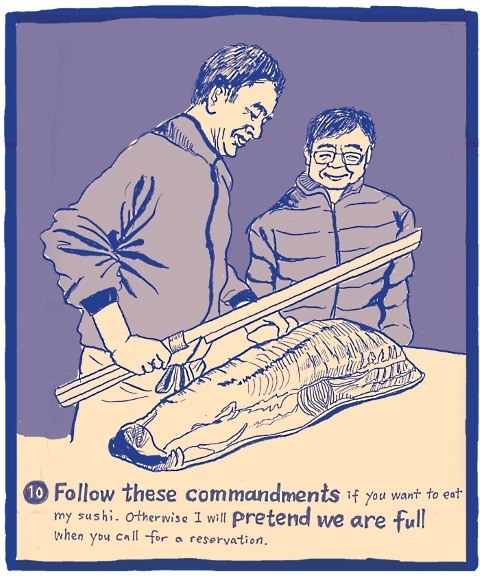 Yajima’s passion for his craft is evident in each of his Sushi Commandments. At first, they might be off-putting if all you want is some simple rice and fish, and maybe a little piece of tamago or some edamame to accompany it. But to Yajima, sushi is life, and he wants you to enjoy it in the best possible way. Once you understand that mindset, his rules make sense. 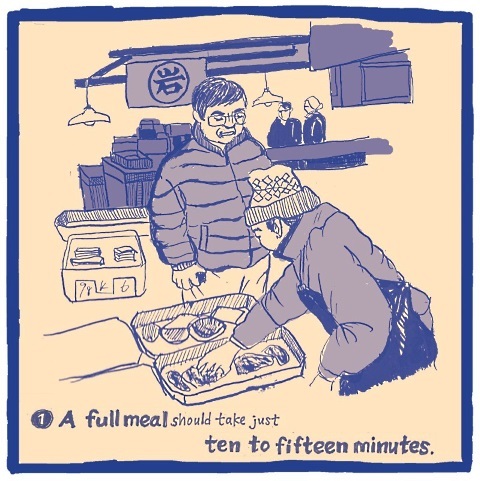 Even if we never make it to Yajima Sushi, we’re certain that reading and following all ten Sushi Commandments can only enhance our enjoyment of sushi in general, wherever we are.